Sometimes you book a resort to get away from the daily landscapes and the usual sights. You are not so interested in getting out to explore the area so the location becomes less relevant. It is then that the resort’s amenities, the facilities and, perhaps, the view, become key. As does the company. After five years living in Singapore, I had not managed to go to Koh Samui. The price was never right and there wasn’t an appealing and magnetic reason to go, so I kept postponing it. In the long Diwali weekend, I finally made up my mind and decided to head to Koh Samui. Knowing Alex’s excitement for the Conrad, we booked a pool villa. The resort looked stunning. The pool villas and the infinite views over the islands in the Gulf of Thailand made for a picture perfect view. In the laad-up to the trip, I read Ben Schlappig’s review and, even with his high well-known snobbish standards and extreme penchant for luxury, he, too, was impressed, so I knew I was in for a treat. 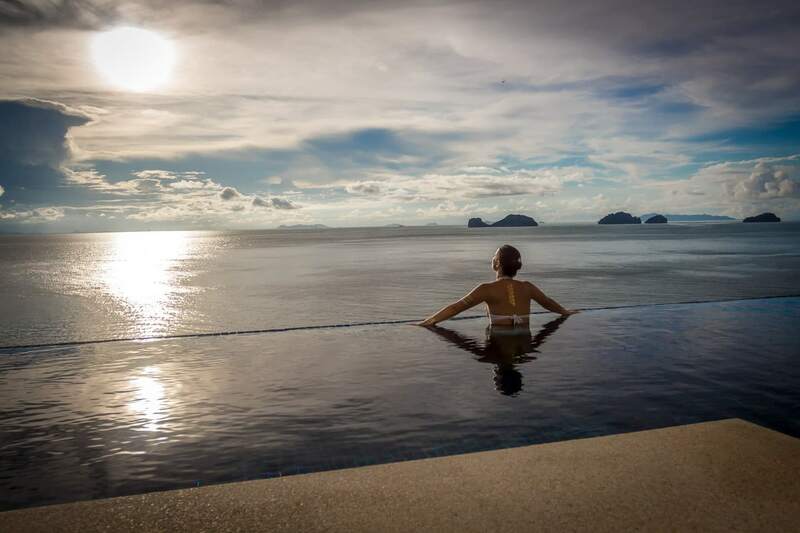 Continue reading for the insider views on staying at Koh Samui’s most beautiful and luxurious property and one with one of the most impressive views in Southeast Asia: The Conrad Koh Samui. For a list of best luxe hotels in Koh Samui read this article, or check out my 4 day itinerary here. The resort is perched on the side of a cliff, literally, and away from any civilization. You could come here and never see a local Thai person. Now take a second to fully grasp this. You could be in Thailand or you could be in Benidorm, for all intents and purposes. You are far away from any interference and all there is is the lush greenery and the complete seclusion of an inaccessible resort. The villas jot out of the cliff wall into the void and hang on top of concrete legs. To reach the lobby, you must drive all the way to the top of the cliff on a series of zigzagging turns. Arrival is dramatic as you peek your head down to the rows of pool villas below. The reception is open, sleek and modern. As it was late when we arrived, we were handed wet towels and a beautiful lemongrass drink to enjoy while we signed all the check-in paperwork. Within a few minutes, we were escorted to the buggy that would take us down, through a series of snaking paths, to our room. The descend was exhilarating, not least because the views from the reception down into the pool villas had built-up an anticipation and I was ready to step into our dream villa. It all looked slightly unreal. I almost needed to be pinched. Alex will know that I tried to hold my breath as I didn’t want to look like a child with a new toy. All villas are the same except for the larger family villas which have two levels and a living room for families to get together. There is also a Royal Villa, go figure how splendid that one may be. Each of the pool villas had a 10m infinity pool with views into the ocean. The sunsets from the pool edge were spectacular. Inside, the space was large with two clearly separated areas. The bedroom, with a king size bed, a desk, a TV and a sofa, was decorated in earthy tones and felt very warm. 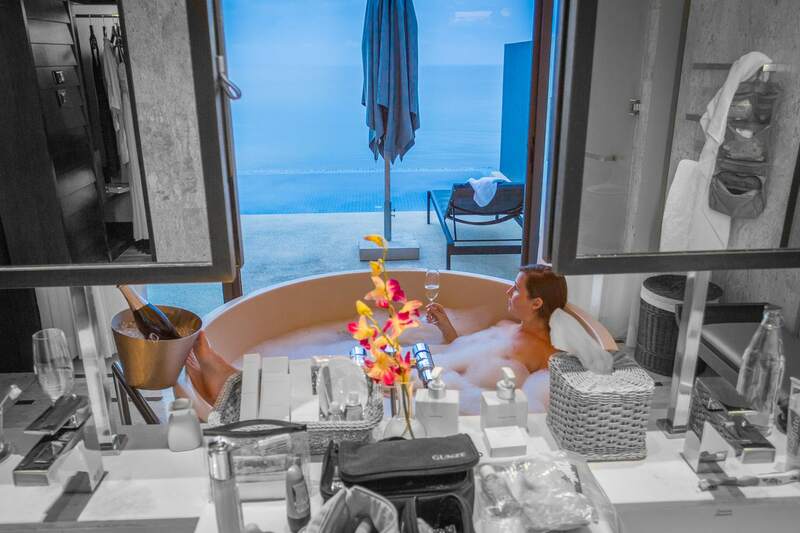 The bathroom, across sliding doors, was almost as large as the bedroom and had a free standing circular bathtub that looked like a cereal bowl and had the same views as the pool, his and hers sinks and mirrors and pale marble walls and floors providing a sense of continuity. The bathtub could easily fit a few people, I couldn’t reach the other end of it with my feet when sitting in it. The space flowed really well and the bright colors were punctuated by dashes of purple orchids. Did I mention that the bathtub had a TV? That’s right. There was a subtly hidden TV screen in front of the bathtub, should you prefer the modern day amenities to the stunning sunset… Not me. The walk in closet had enough coat hangers for us both to neatly hang our clothes so they would not get wrinkled. It also provided us with enough space to lay out all our suitcases, the drone case and everything else in a tidy manner, even if I am not the tidiest of persons. All of the villas face the sunset, and that is a treat. I could go on and on about it. Seeing the sun slowly descending was simply beautiful, one of the most romantic sunsets I have ever seen. 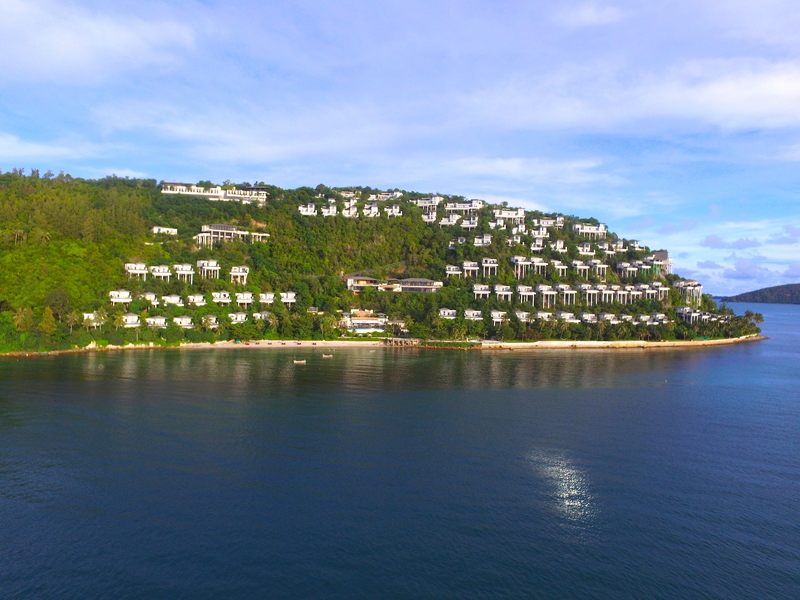 The villas were, no doubt, the best there is on Koh Samui. They were large, they were perfectly crafted and they were full of small details. The controls were easy to find and operate and you could plug your iPhone/iPod or play any movie from the Apple TV. The WiFi was strong and it covered the entire resort. Even when we were in the buggy going up and down, the signal never dropped. That was some pretty impressive set up they had. When we arrived, we had a fruit bowl with a colorful dragon fruit and a mango and beautiful macarons in pretty pastel colors, shame neither of us is a fan! There was a welcome letter and a pretty turtle paperweight which I took home – a small Conrad tradition. I have collected various little animal teddy bears from a few Conrad Resorts and I already have a crab, a nemo and now a turtle. The walls of each villa and the vegetation were built in a way where privacy was almost entirely guaranteed but I would not recommend dipping into your pool naked because it is easy to be seen by the neighbors around if they walk to the end of the pool’s edge, or above you, an angle we would never think to check. The villas are scattered along a fairly stretched out area so you never felt like there are any other guests and, since the villa pools are so impressive, there is hardly any reason to venture out into the common areas. Not that they were uninviting. The swimming pool was fancy, with glass walls through which you could see the beach, one level down. 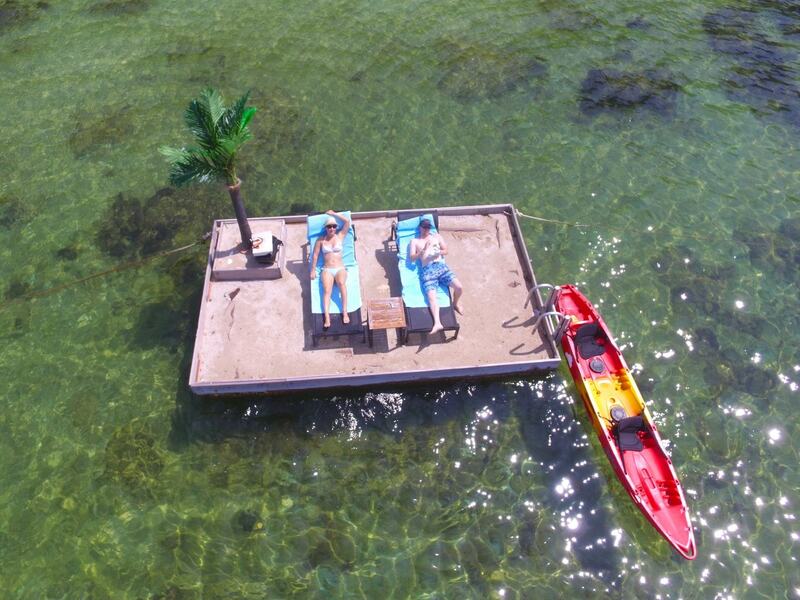 There were sun loungers sunken in the pool water edge and cabanas where to relax protected from the sun. It was private and secluded, like everything else in the resort. At the lowest level laid the two beaches. A first one, slightly above the water, with a sandy and grassy area, and a second one, a few steps down a wooden staircase. The “real beach” was relatively narrow and could be washed away by the high tide but it was perfect when we were there. 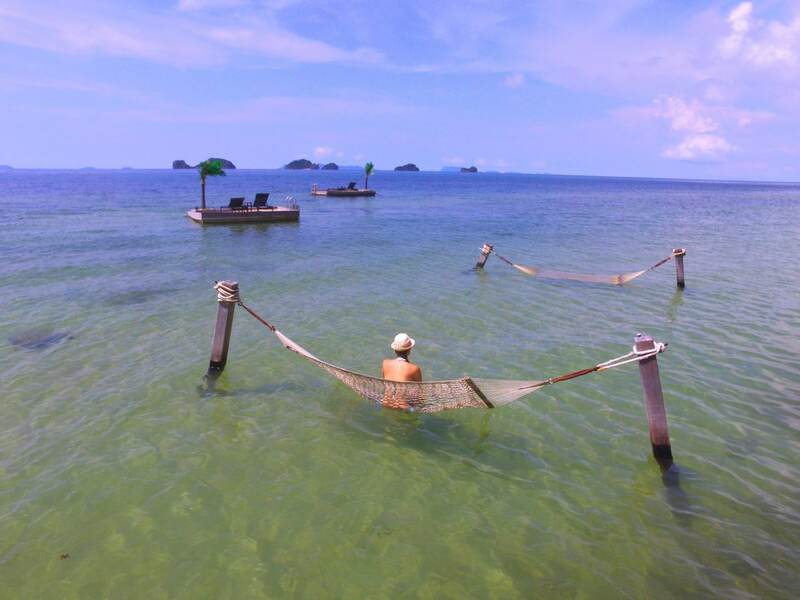 In the shallow waters by the beach there are two hanging hammocks in the water and two floating platforms where two sun loungers had strategically been placed. From there, you could admire the beauty and incredible architecture of the resort. The beach faces a few of the islands and islets. The hotel provides a free snorkeling service to a nearby island on the resort’s speedboat twice daily and that beach, although we didn’t heck it out, seemed to be quite pretty. There is also the usual gym and a magnificent spa with the same views and on the top level. We did not try it out but it had good reviews for the usual hotel price of $100 per hour. Conrad Koh Samui has three restaurants and a great room service. Given the isolation of the place you are not likely to venture out unless you have a car. And even then, the resort is so inviting and romantic that you will be hard pressed to miss sunsets there. Zest is the breakfast venue and it is also open for lunch and dinner. It has both an indoor and outdoor area and it is about half way down from the reception area. The breakfast spread was rather short. I was a bit surprised by this. Not that it was bad, but for a resort of this cache I was expecting the breakfast to be mind blowing. It was good, but it had nothing that I and never seen before and it did not surprise me in any way. Let me be clear here, I enjoyed the smoothies and the waffles looked fabulous. Being a croissant connoisseur, I will say the pastries were good. But there was nothing that was impressive. I am trying to be picky here because of the room rate and because I had to find something to fault the resort on! There was an egg and waffle/pancake station and a menu to choose cooked options like eggs. Chinese and Thai options were also available and several tiny bite sized canape-style concoctions were neatly placed in the wall’s shelves. The fresh juices and banana/strawberry smoothies wee divine. We had dinner at Zest to a mix of international and local dishes. Stick to the Thai options and you will be fine, they were delicious. There are two other dining options, Azure by the pool, were lighter dishes were available, and Jahn, the fine dining venue on the hill. Azore is informal and offers cabana dining, a great option for a private and romantic dinner under the stars or for a lazy lunch in the sun. The menu had salads, sandwiches and other light options and a long cocktail list for a pool umbrella drink. The staff were remarkably friendly and helpful, even taking the mosquito repellent and spraying my legs for me. Jahn was formal, think shirts and jackets, necessary given the strong AC, and offered a la carte and a degustation dinner menu. 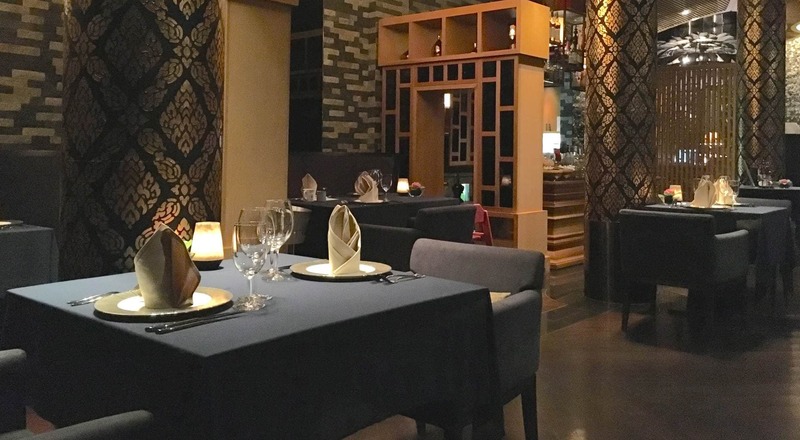 The chef re-interprets Thai dishes with a fine-dining approach. Presentation matched the style and the price. 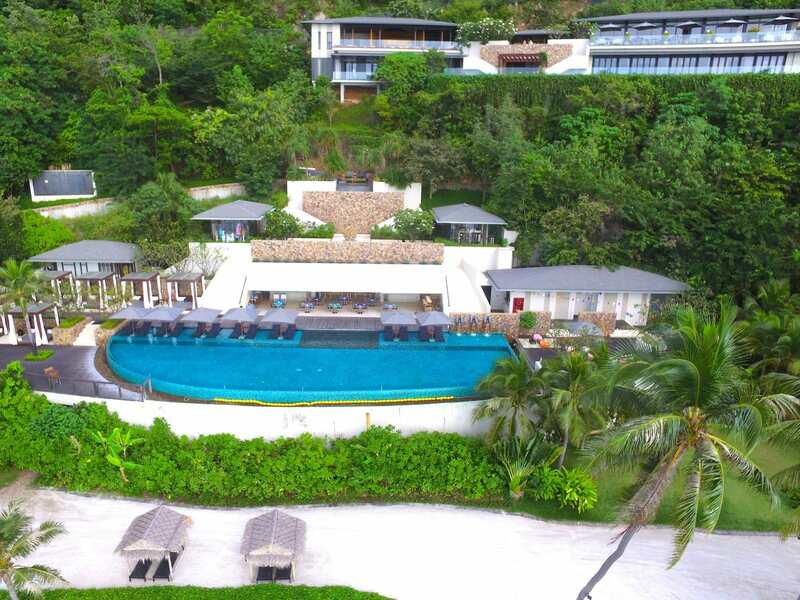 The resort offers complimentary pick up and drop off service from other resorts to Jahn as it is one of the few fine-dining options on the island and the Conrad Koh Samui is pretty far away from everywhere. Jahn had pretty sunset views so it was a god idea to come before dinner to see the sun come down at the open air sofas in front of the restaurant. The set-up was cozy and romantic with dimmed lights and darker black and golden tones. It was refined Thai food with international influences. It was good, and a welcome to the rest of the more casual settings, but it was a tad expensive. On Saturday night there were fireworks on the beach which could be seen from anywhere in the resort. As soon as we arrived and I realized that we would need a buggy to go everywhere (do not attempt to walk, even if it is just a few metes away, the steep incline will make you sweat straightaway), I was a slightly worried. Having been to a fair amount of resorts where you need the staff to pick you up and drop you off everywhere I get claustrophobic and stressed when I have to call, wait, call again, complain, etc. At the Conrad there was none of that. Every time we called the buggy, or we needed one, it would magically and quickly appear from somewhere. The resort had a real fleet of them and they were never too far away. That made the stay really convenient. All our dealings with the staff, including a time when our WiFi stopped working or when we needed to order fresh ice and a bucket for our prosecco, were perfect. Everything was delivered with high speed and diligence and they were excellently trained and very friendly. What can I say. This was a sublime stay. The service was personal, swift and great. The food was good and enjoyable and the pool villas were just superb. There are few words one can use to describe the place, best is that you just look at the photos. And yes, everything else that you may need will also be of the same luxury and professional service as the views. 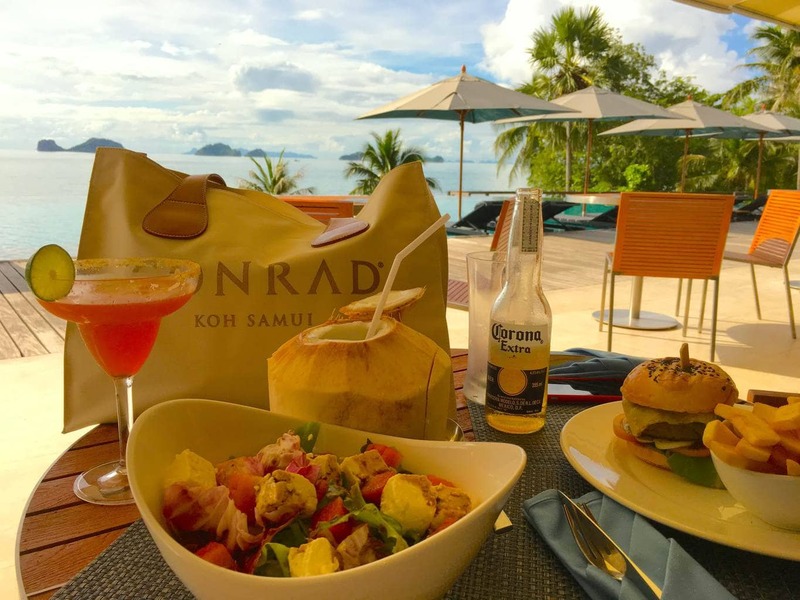 If you are going to Koh Samui for a romantic getaway, Conrad Koh Samui is the place to go, for those views will make you fall in love again.